ISS staff members Noel Stott and Nicolas Kasprzyk participated in an IAEA Regional Training Workshop on Security in Practice for the Uranium Ore Concentrate Industry, including during Transport from 8 - 12 June 2015 in Livingstone, Zambia. The workshop was funded by the US (National Nuclear Security Administration) and the EU Commission (Joint Research Centre). Noel presented a paper providing an overview of ‘Global Nuclear Security Concerns and in particular for Uranium Ore Concentrate’, in the broader context of security concerns in general and in particular nuclear security concerns. The event gathered regulators and operators from Benin, Botswana, Central African Republic, Democratic Republic of the Congo, Malawi, Mali, Mauritania, Namibia, Niger, Tanzania and Zambia, as well as resource persons from Australia, the United States (Brookhaven National Laboratory, Nuclear Regulatory Commission), the International Atomic Energy Agency, the European Commission (Joint Research Centre), the private sector (AREVA, AREVA-TNI, Gamma Safety Services, Innovative Solutions Unlimited LLC) and the academia (Institute for Security Studies and Danish Institute for International Studies). Zambia’s Deputy Minister of Health opened the workshop. He showed strong support for the work that radiation protection authorities are doing in the area of nuclear security. The event was also graced by the Zambian Radiation Protection Authority Board Chairperson Dr Esther-Nkandu Munalula, who thanked the Government for the continuous support it has been providing to the Authority. The workshop was a follow-up to the International Atomic Energy Agency’s (IAEA) Regional Seminar on Good Practices in Processing and Control of Uranium Ore Concentrate (UOC), held in Namibia in 2012, at which ISS was also a participant. It was also a follow on from two ISS, European Union and the NNSA-hosted workshops held in Brussels, Belgium. The first, "Strengthening Peaceful Uses of Nuclear Energy” was held in February 2014 and the second, “a Regional seminar on Uranium mining, milling and transport” was held in October 2014. The main objective of this workshop was to introduce and discuss the forthcoming IAEA technical document for nuclear security in the uranium extraction industry, discuss additional aspects of UOC prudent management practices and use exercises to reinforce these measures. Additionally, the workshop included elements of the interface between safety, security and safeguards for the production, storage, and transport of UOC. The IAEA’s draft technical document entitled ‘Nuclear Security in the Uranium Industry’ identifies practical and implementable nuclear security measures that are considered relevant for the prudent production, storage and transport of UOC. This document, the implementation of which is voluntary, is intended to fill a gap with respect to UOC for States, regulatory bodies, and industry to prevent unauthorized removal of UOC. 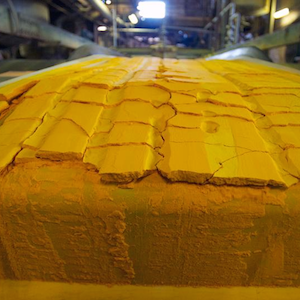 States have a legal obligation under a number of treaties and other international instruments to ensure effective regulation of uranium production and exports. These include the Nuclear Non-Proliferation Treaty (NPT), safeguards agreement with the IAEA, the additional protocol to the safeguards agreement, the Convention on the Physical Protection of Nuclear Material (CPPNM) and its Amendment, UN Security Council Resolution 1540, as well as regional treaties such as the African Nuclear-Weapon-Free Zone Treaty. In addition to meeting international obligations, effective regulation of uranium production and export is essential for reasons of good governance – e.g. to protect the public and companies against theft and other criminal activities, to protect government revenue (e.g. royalties and taxes), and to maintain public confidence in the security and safety of the nuclear industry. In his closing remarks, the Chief Executive Director of the Zambian Radiation Protection Authority, Mr Boster Dearson Siwila, summarised the exchanges in the different areas addressed by the workshop, in particular: international perspectives on implementing prudent management practice for UOC; international obligations and guidance for implementing prudent management practice for UOC; state regulatory perspectives; and, industry perspectives. He also shared the lessons learned from the hands-on exercises which involved all participants in the workshop: an exercise applying the recommendations in the IAEA draft technical document to the Facility Security Plan of an hypothetical uranium mine; an exercise focused on the Transportation Security Plan; an exercise based on a broader scenario centred on a truck lost from a transportation convoy, requiring participants to formulate a plan of action to respond to the crisis.